A collection of web stores that I recommend and some astro-items which I think offer a great value. First Light Optics. (UK) Great customer service has made FLO probably the most popular UK vendor. Their support extends to pre-sales, so you can get help even before buying. Teleskop-Service. (GER) TS is probably even more popular in Europe overall than FLO, for similar reasons. Fortunately their website has an English version! Agena AstroProducts. (US) While they carry a wide range of astro products, they are mostly for their own branded good quality but inexpensive products (e.g. eyepieces), that you might find under more expensive brands elsewhere. It is often cheaper for Europeans to order something from Agena in the US than buy it directly from Europe. Altair Astro. (UK) They carry many great value Altair-branded items, like their CMOS cams (Hypercam, GPCam), their Lightwave refractors etc. Also the European distributor for iOptron. Amazon.com, Amazon.co.uk etc. It is always worth checking out whether Amazon has a good price on the item you need. Their free (and fast if you are a Prime member) shipping, easy returns and amazing customer support make them a good retailer for anything, not just astro products. Just make sure you check if something is sold “by Amazon” and not a 3rd party seller, otherwise it is a bit like buying from ebay. Ebay, Ebay.co.uk. 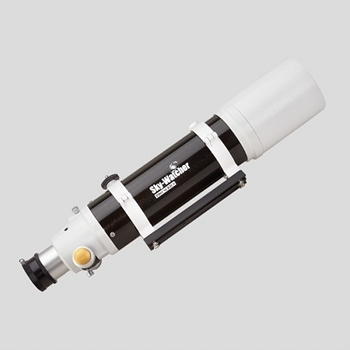 Ebay is not good for buying something like a brand new telescope or accessory, since you can find them cheaper (and with better customer support) from somewhere where ebay will not take a cut of the sale. However, for second hand items and some cheap no-name (i.e. chinese) items you can get some good value out of ebay! Astroboot. (UK) Interesting store offering various surplus items at discount prices. Has some useful bits & bobs but also complete scopes and OTAs in various “conditions”. Their post-sales support is quite slow, but usually dependable. Cheap Astrophotography. (UK) Astro-modifications or pre-modified Canons at decent prices. Astronomy Buy & Sell UK, Canada, Australia. Free to use site with classified astro-listings. Very popular in the countries it targets. Astronomy Forum Classifieds. You need to be a member with a number of posts to be able to post and reply to ads. Stargazer’s Lounge Classifieds. You need 50 posts to even see the ads here. But it is a nice forum anyway, so it is worth the effort! Cloudy Nights Classifieds. Another popular forum with classifieds section. Sky At Night magazine Classifieds. Classifieds section on this UK magazine’s forum. The simple fact that you can find a decently performing 80mm Apochromatic for a £350 retail price puts this OTA in my list (although it is a better deal as a £470 full package – $650 for the US). Sure, it is not as corrected as a good triplet, but at 1/10th the price many of those ask it is quite hard to see the difference. 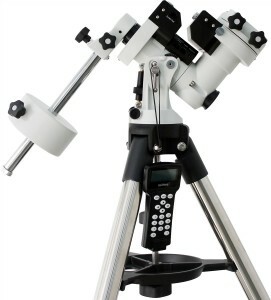 In fact, even dubious Chinese refractors are more expensive than this. The build quality doesn’t leave much to be desired, the optical performance, as mentioned, is indeed good showing very little chromatic aberration as expected from a well designed doublet. What are the cons for this price? Well, the focuser is Skywatcher’s basic dual-speed Crayford which might not be that good with some heavy equipment (dslr etc) on it, and it is not super-fast at f/7.5 (I assume to avoid showing more CA with the design being just a doublet), but there is a matched 0.85x reducer/corrector that might help with that, along with flattening the field. I consider this the ultimate mount for those who want an extremely portable astrophotography setup that is a good match for a 3″-4″ APO, especially with the smaller 1.5″ tripod which has a very limited footprint. In fact, despite a feather-light mount head (4.7kg) it can even handle my C9.25 quite well. The older ZEQ25 is very similar (in fact only the motors an control board are different), so just have a look at my review for more details.